Not to long ago I was at my local card store chopping it up with the employees I’ve known since I was a little kid at the store while simultaneously digging through dime boxes. Card after card I was left unintrigued until I stumbled upon this. 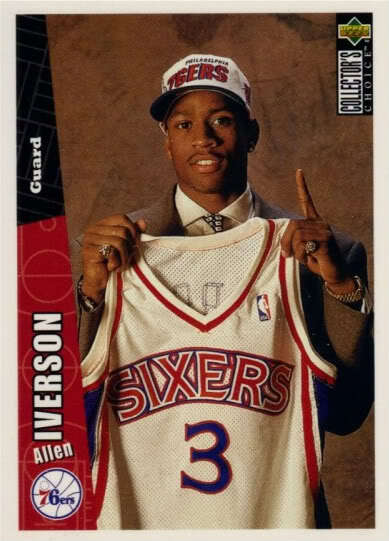 While it is a regular base card it happens to be a card of one of the dudes responsible for getting into sports and that man is Allen Iverson. The card pictured above is an Upperdeck Collectors choice rookie card of A.I. He is holding up his #3 Sixers jersey and that was the 1st moment in a career chalk full of moments good, bad and everything else in between.